Erdely threw for 180 yards and ran for a touchdown. BIRMINGHAM, Ala. (AP) - A.J. 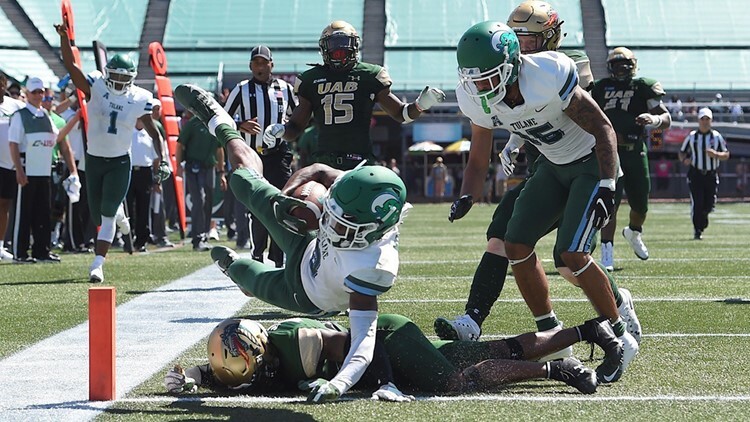 Erdely threw his only touchdown pass of the day with just over two minutes to play, finding Logan Scott for the winning score and UAB beat Tulane 31-24 on Saturday afternoon. The teams were tied at 24 following a Tulane field goal earlier in the fourth when Erdely capped a 13-play, 93-yard drive with a 14-yard touchdown throw to Scott for the lead with 2:19 left. The Blazers (2-1) forced a Jonathan Banks fumble on the following Tulane drive to help preserve the lead. Late in the first half, UAB defensive lineman Garrett Marino recovered a Banks fumble near midfield - following a sack by Kristopher Moll - and ran 48 yards for a score, giving the Blazers a 21-7 lead at halftime. Erdely threw for 180 yards and ran for a touchdown. Spencer Brown ran for 101 yards and a score. Banks finished with 180 yards and two touchdowns for the Green Wave (1-2).